There are many problems homeowners may encounter when it comes to roofs. From cracked shingles to leaks, it’s important to address these issues head-on once you notice them. It’s also important to do whatever you can to educate yourself about the problems associated with a roof so that you can prevent them at all costs. One roofing issue homeowners are frequently forced to deal with is moss growth. 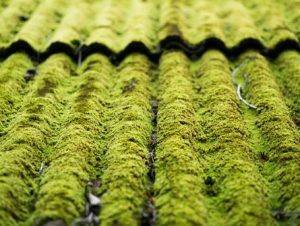 When moss grows on your roof, it can make it look unsightly. It can also threaten the structural integrity of your roof and cause problems with your shingles and everything underneath of them. It’s why you should familiarize yourself with why moss grows on roofs in the first place. Moss tends to grow on roofs that are moist and humid. Additionally, moss seems to grow better on roofs that are shaded and that only receive indirect sunlight. Roofs with a lot of leaves on them can also encounter moss due to the nutrients located in those leaves. The nutrients are just what moss needs to grow at a rapid pace. Once moss begins to grow on your roof, it will hold water and cause all sorts of problems. The moss could cause your shingles to break apart. It could also pull the shingles away from your roof and get underneath of them. Regardless, moss is not good for your roof, and you should maintain your roof and inspect it regularly to stop the growth of it. Do you have a moss problem on your roof? Roofing by Bruce can take care of it right away with our roofing services. From removing moss to preventing it from popping up initially, we can ensure moss doesn’t harm your roof. Call us at 570-424-8891 today to have an experienced roofer come and take a look at your home’s roof.